The Redneck Xtrem 36 is the fastest speedboat of Phuket, built & customized by the team of Speedboat Xperience, to fulfil your highest dreams ! Your private speedboat charter from Phuket Whether you’re looking for a full day escape, half day experience, or a romantic voyage for just you and a loved one, you will have the time of your life with this amazing speed boat Redneck Xtrem 36, the #1 in Phuket ! The luxury of visiting the island on this fastest speedboat could only be compared to the lifestyle of the international Jet setter James Bond. This speedboat pushes the boundaries a step further to experience speed sensations, but always in a safety environment. 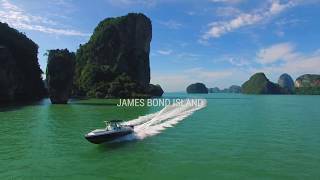 Speedboat Xperience puts its expertise and professionalism at your service in a friendly atmosphere, closer to your expectations and your desires to make your vacation in Phuket a moment of eternity. Y - 1 Go Pro and WIFI Sound System connected to devices. When more than 6 guests, an additional 3000THB per guest will be charged.